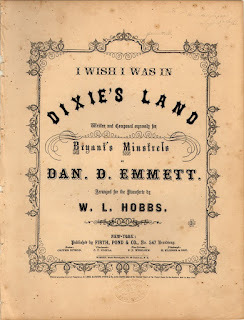 Dixie was written by Daniel Decatur Emmett, composer of other enduring favorites like “Blue Tail Fly” and “Old Dan Tucker.” Emmett was actually a Northerner, one of the famed Bryant Minstrels. As the story goes, in 1869 the Bryant Minstrels were playing at a theater on Broadway but they were losing creative energy. One Saturday night Jerry Bryant, the troupe leader, decided the show need some new songs to generate enthusiasm among the audience. So Bryant asked Emmett to write a new grand finale song—and have it ready for rehearsal Monday morning, please. Now, the typical minstrel shows of that time included parlor songs, caricatured mock-opera comedies, and scenes and music relating to life on a Southern plantation. Then there would be the grand finale. This grand finale was what Emmett was supposed to write. So Emmett sat down to think out a song but he wasn’t feeling inspired. The day was rainy and cool and he sat in the kitchen glaring at the rain, wishing for the warm, sunny days of the South. “I wish I was in Dixie,” he muttered. That was it! Struck by his own words, he quickly penned the words and music. When the song was first performed, even though Bryant opted not to use it as a grand finale, it became an instant hit and spread across the nation. In December, 1860, John Dwight, the editor of Dwight’s Journal of Music wrote that the orchestra at a St. Louis theater played Dixie before the curtain rose on a play. A few moments later one of the actors stepped out for the opening scene—but the crowds roared for “Dixie” again. The audience would not settle down and the actor stormed furiously off the stage. The manager appeared. “Gentlemen, what means this ill-mannered confusion, what do you want?” he bellowed in a rage. “Well, you can’t have it!” he thundered back. “You’ve had ‘Dixie’ once tonight and you’ll have ‘Dixie’ no more!” He walked off, thinking he had settled the matter. But as soon as the actor reappeared on the stage, the crowd roared for “Dixie” even louder than before. Fine! Down went the curtain, the orchestra played “Dixie” one more time, and everyone was happy and sat back quietly for the play. “Dixie” was played at Jefferson Davis’s inauguration, linking it inextricably to the new Confederacy, and helping to establish the song as the unofficial national anthem of the South. Interestingly, it is said that "Dixie was also Abraham Lincoln's favorite song! Some Southerners objected to the slapstick nonsense words of the song. Henry Hotze, a reporter from Alabama who was sent as a delegate to England to spread sympathy for the Confederate cause, expressed wonder about the, “magic potency...in those rude, incoherent words, which lend themselves to so many parodies, of which the poorest is an improvement on the original.” The “rude incoherent words” are still a favorite today though, so apparently no one heeded his criticism. “Southrons! Hear your country call you! This version would prove very popular as well, in addition to many other spoofs, parodies, and alternate versions. 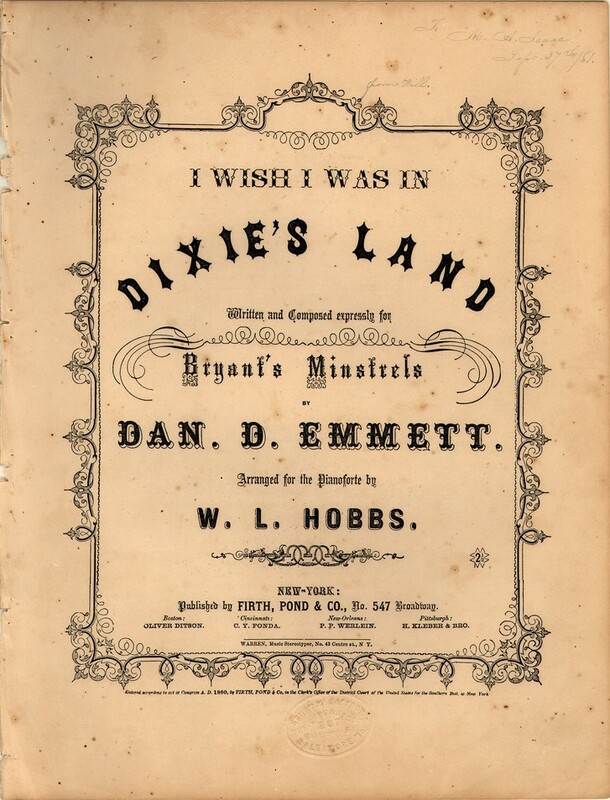 Today Dixie is still a wildly popular song in both the North and the South. 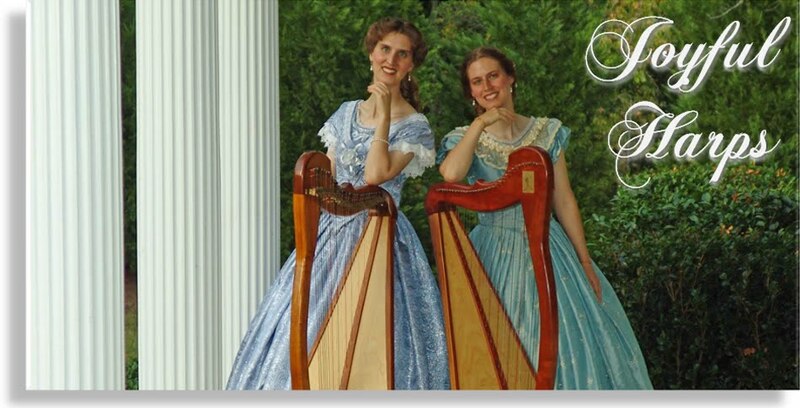 We have two versions of Dixie on our CD "Joyful Harps 1865" - a slow version and a fast version. You can buy the CD by clicking here or you can buy the MP3 files in our shop.